What is a Massachusetts Quit Claim Deed? Massachusetts Quit Claim Deed: What Is It? A Massachusetts quit claim deed is a document used to convey property the Grantor, the person who owns the property, to the Grantee, the individual purchasing the property. Using a quit claim deed the seller is transferring his or her ownership interest to the seller. 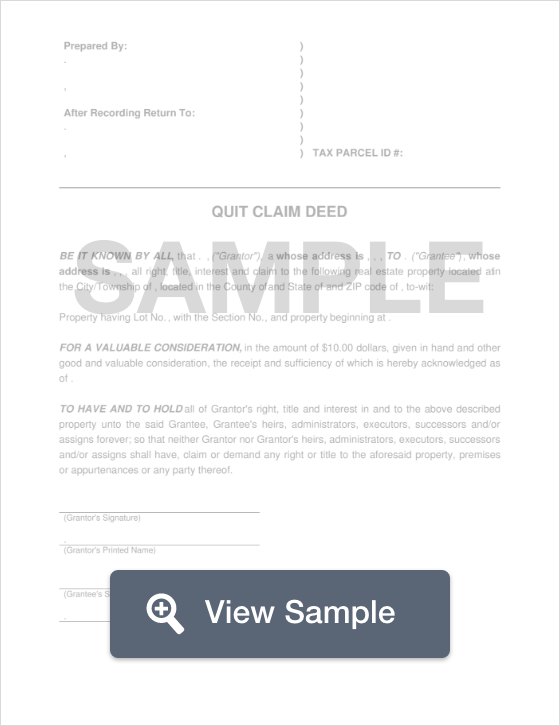 It is important to note that a quit claim deed comes with no guarantee. This means that the title may or may not be clear, or the seller may or may not have the legal authority to sell the property. It is very important that the buyer conduct a thorough title search to ensure that the title is free and clear of any encumbrances. Signing - According to state law (Chapter 183, Section 29), the Grantor must sign the quit claim deed in the presence of a Notary Public. Recording - Once the form has been notarized and signed by the Grantor, the quit claim deed must be filed with the Registry of Deeds Office along with the proper filing fees.